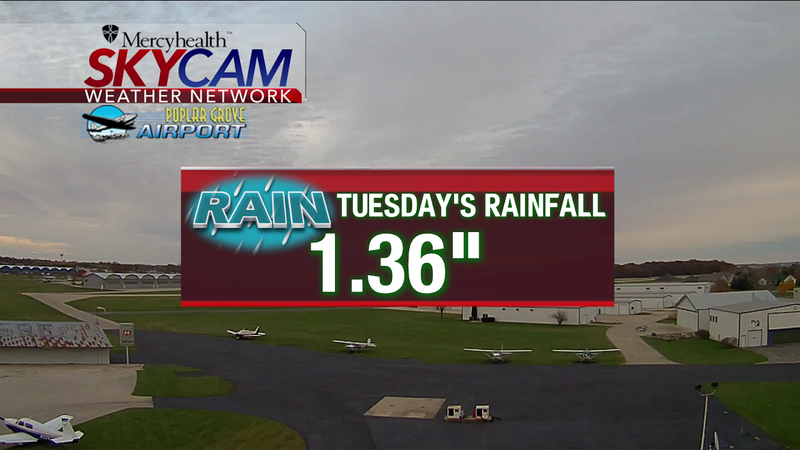 It was a very rainy Tuesday afternoon and evening with many locations receiving over an inch of rain. 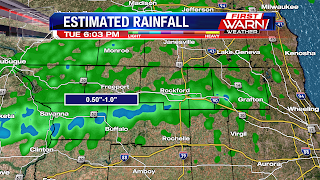 Rockford broke the daily rainfall record Tuesday with 1.36 inches falling. The previous record was 0.97 inches set all the way back in 1967. The beginning of the month was very rainy with nearly four inches of rain coming down within the first week and a half. 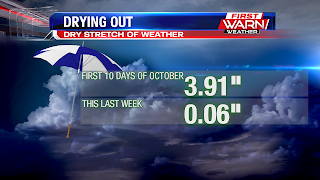 The remainder of the month had been fairly dry, and cool, until Tuesday afternoon. Skies will remain dry through the end of the week, but a series of storm systems early next week will bring back the chance for more rain, followed by a quick cool down. 10:30pm Update: The heaviest rain has come to an end, but scattered showers will continue through at least Midnight before shifting east during the overnight. 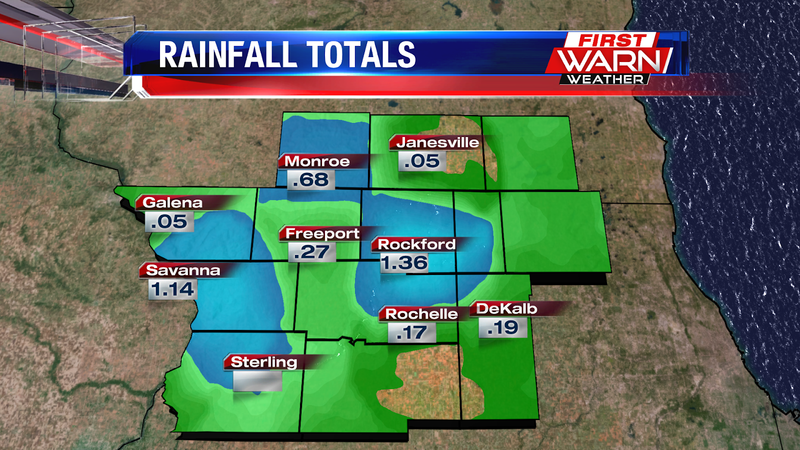 Rainfall totals have been quite impressive for some, adding up to over one inch in some locations. Mostly cloudy skies will stay with us during the overnight and into Wednesday morning. 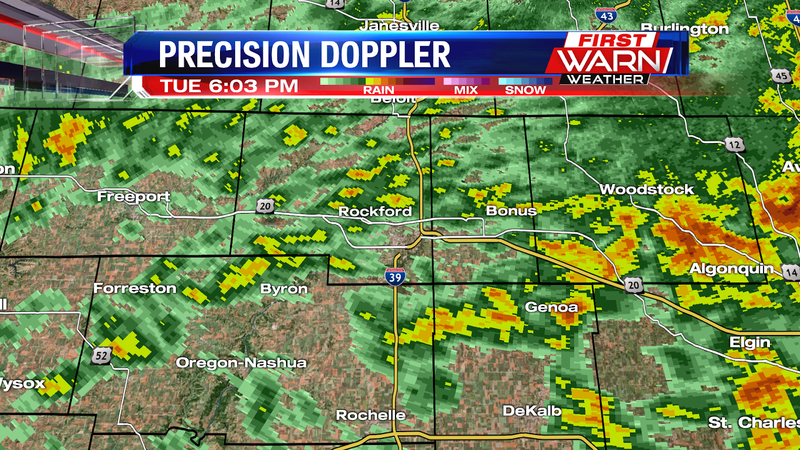 Heavy rain producing thunderstorms have been moving through northern Illinois and southern Wisconsin Tuesday afternoon. 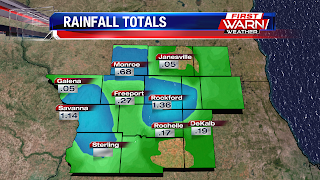 Rainfall totals from Carroll, Ogle and southern Winnebago counties have already added up to nearly one inch, with more scattered activity further to the west. A cold front stretches from northeast Wisconsin down through Dubuque, IA Tuesday evening and will clear the Stateline during the overnight. 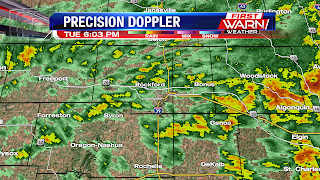 This will bring an end to the heaviest rainfall late this evening. 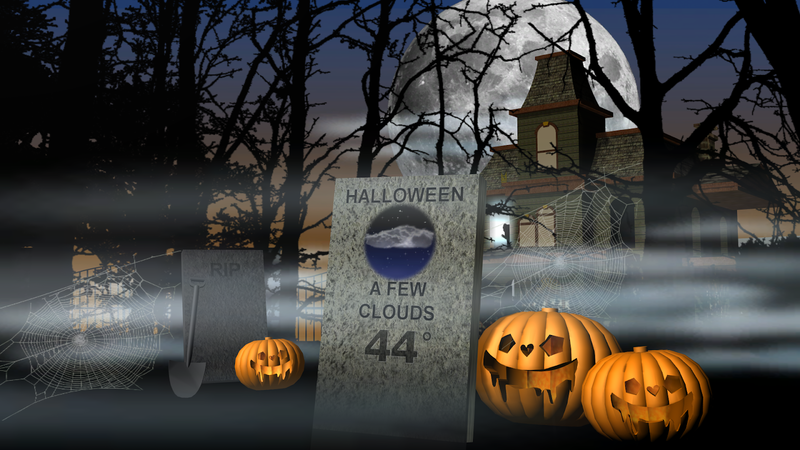 Skies will remain mostly cloudy with temperatures reaching the low 40's by Wednesday morning. Cloud cover will continue to thicken up Monday night into Tuesday morning, with rain chances increasing by Tuesday afternoon. Low pressure will move across southern Canada as a cold front pushes through Midwest and Great Lakes Tuesday afternoon and evening. Increasing moisture ahead of the front will allow cloud cover to thicken up during the morning and showers to develop during the afternoon and evening. 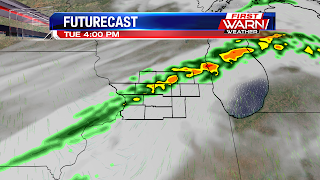 Rain showers, and even isolated thunderstorms, will develop between 1pm and 3pm as the cold front passes to the east of Rockford Tuesday evening. Severe weather isn't expected, but some of the thunderstorms could contain heavy rainfall and even gusty winds. As the front moves through, fog will be possible through the evening until drier air moves in helping to clear skies during the overnight. Rainfall totals will be up near half an inch in some locations, but potentially higher east and southeast of Rockford. Partly to mainly sunny skies to start off you work week. Clouds will build throughout the day turning partly cloudy later on. Clouds tonight will continue to increase turning mainly cloudy by Tuesday morning. 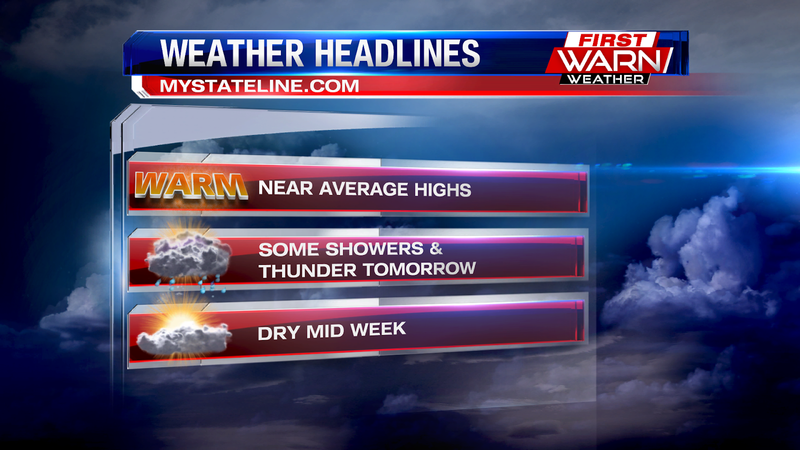 Expect showers and a few rumbles of thunder Tuesday. 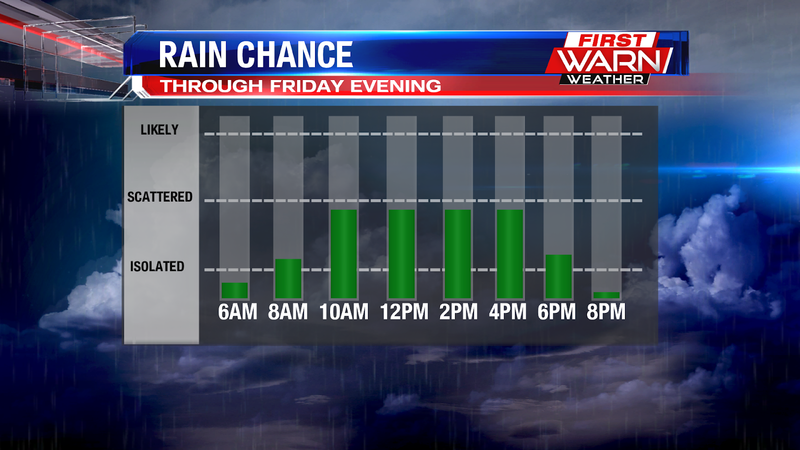 The best chance will be during the afternoon and early evening hours. Behind the front, we will dry it back out for Wednesday and Thursday. 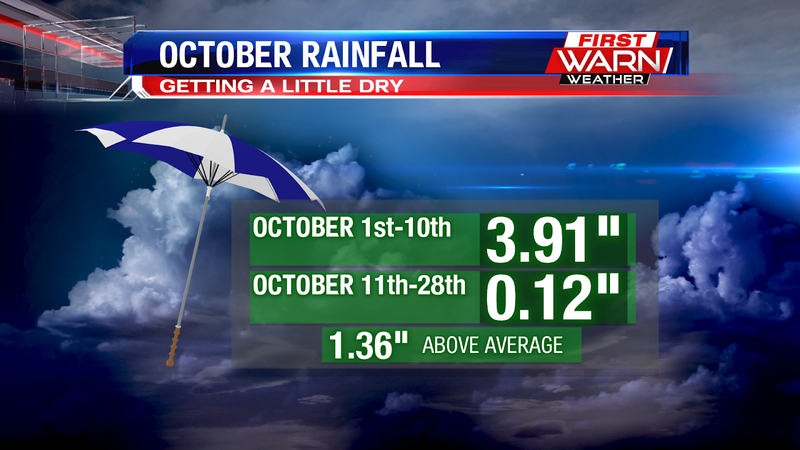 Any rain on Tuesday will only add to our above average trend this month. Since the 11th, we have only seen 0.12", and 0.06" of that just fell yesterday. Looking ahead to the forecast for Halloween, it should be partly cloudy with temperatures in the lower 40s. It's hard to believe that Halloween is just two days away, but then Thanksgiving, Christmas and New Years will be here before we know it! All good things must come to an end and unfortunately that means an end to the sun-filled skies from earlier this week. Mostly cloudy to cloudy skies will stick around through the weekend, with a few light showers developing late Thursday night and Friday. Increasing moisture from the south and west allowed clouds to quickly move in Thursday morning, but drier air near the surface prevented any rainfall from reaching the surface during the afternoon and evening. As moisture continues to be pulled into northern Illinois and southern Wisconsin, eventually the entire atmosphere will become saturated allowing the rain to reach the ground. This will likely occur after Midnight, and most likely between 2am and 4am Friday morning. The more steady rain will occur further downstate, closer tied to where low pressure will be located. 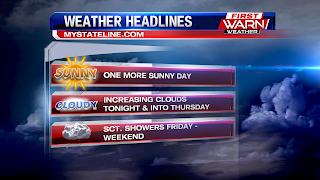 Skies remain mostly cloudy Friday with light drizzle/showers through the afternoon. 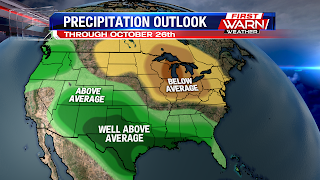 Most of Saturday looks to remain dry but a quick moving low pressure system will dive southeast out of the northern Plains Saturday night, and into southern Wisconsin by Sunday morning. Warm air ahead of the low will allow rain showers to develop and continue into the morning Sunday. 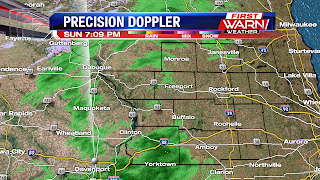 Once the low passes Sunday afternoon most of the showers will be ending, but a few will linger into Sunday evening. Rainfall totals will remain light and under a tenth of an inch from Thursday night through Saturday afternoon. Even on Sunday rainfall totals will be light and right around a quarter of an inch. 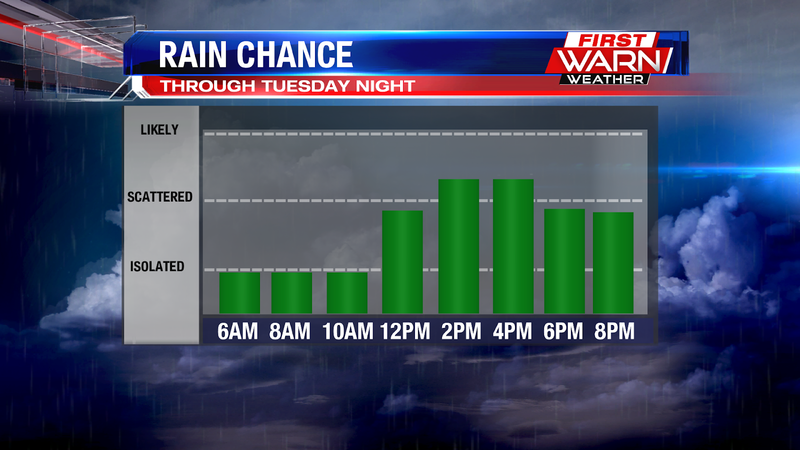 After Sunday the next chance for rain will move in Tuesday and Tuesday evening. 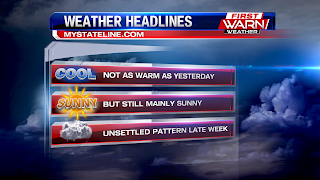 One more sunny day is expected today as high pressure continues to dominate our forecast. The are of high pressure will slide to the east, and clouds will build into the Stateline area tonight. 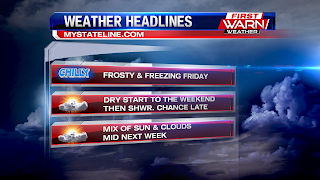 We will start off mainly clear, but turn partly cloudy by early Thursday. 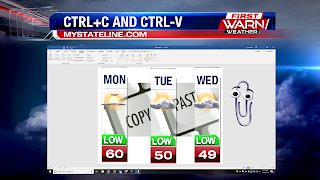 Then we will quickly turn mainly cloudy during the afternoon Thursday. We will remain dry throughout the day, but there is a slight chance late in the day. Slight chance for scattered showers Friday and Saturday, and then possibly mixing with a few snow flakes on Sunday. With the cool start to the day, you'll want the light jacket this morning. 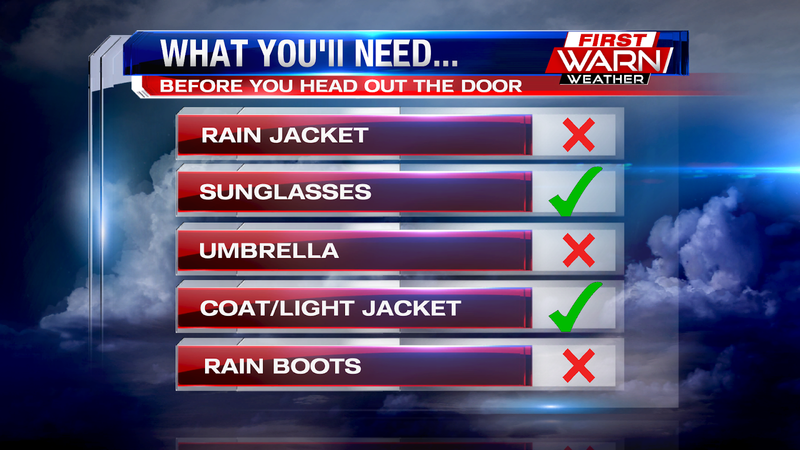 And then into the afternoon hours you will most certainly want the sunglasses handy with partly to mainly sunny skies. If you enjoyed the sunshine and warmth yesterday, more sunshine is in store today. The only downside is that it won't be as warm today as it was yesterday. We will only make it into the lower 50s, whereas yesterday we were in the mid 60s. The sunshine doesn't last all that only either because late week and into the weekend we turn unsettled. 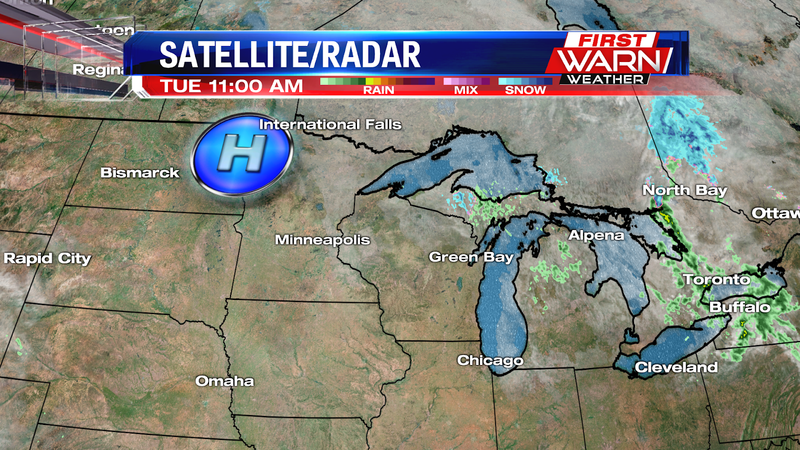 High pressure is keeping us dry and sunny today with highs back down into the lower 50s. One more sunny day is in store tomorrow as high pressure continues to track to our north and east. Then we will see a few more clouds build into the area Thursday with the slight chance of showers late in the day and into your Friday. 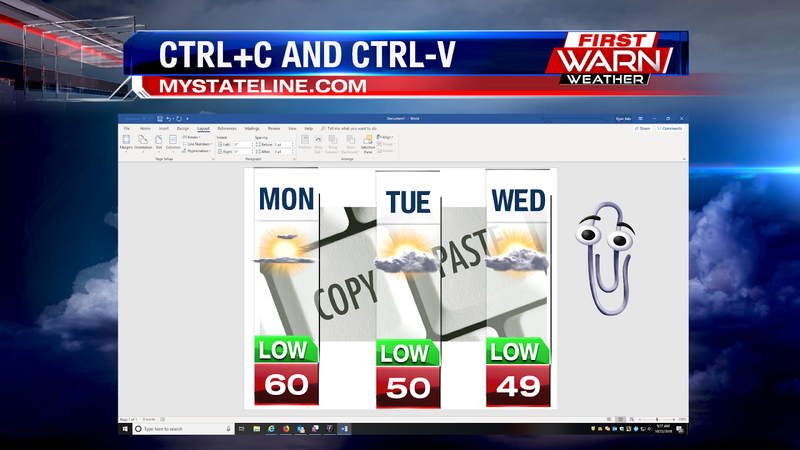 Tomorrow's sunshine is as easy as copy and pasting. Sun-filled skies Monday afternoon warmed temperatures into the low to mid 60's, with Rockford officially reaching 66 degrees. 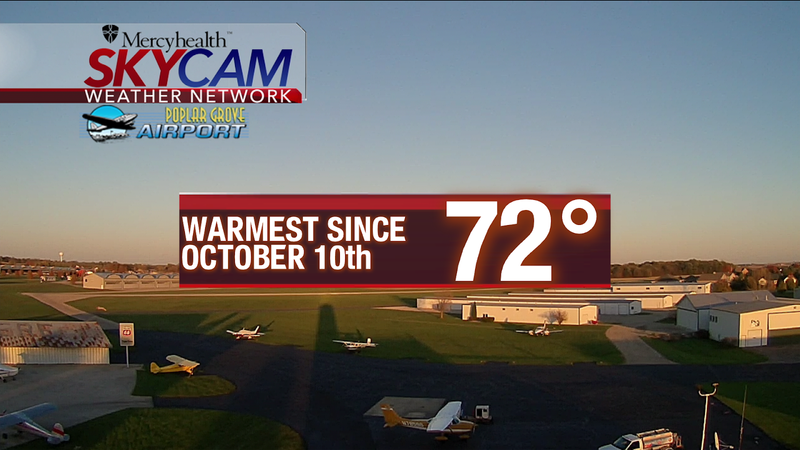 This was the warmest temperature since the 10th of October when the high that afternoon reached 72 degrees. That was also the last day the temperature was above average. 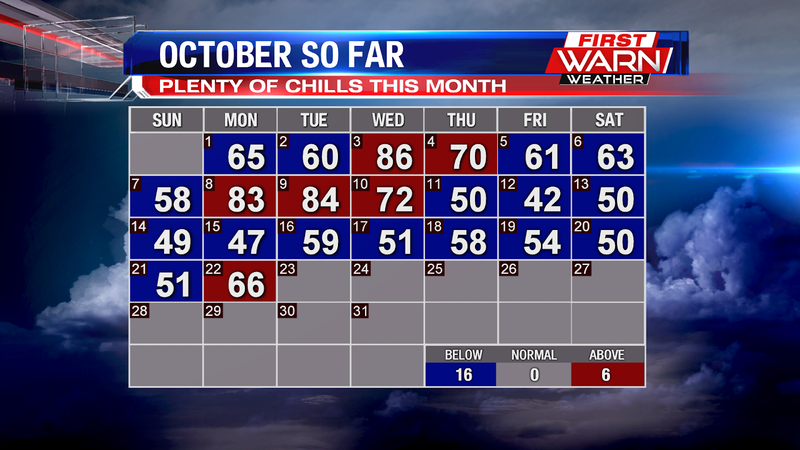 Highs since then have been below average, with some days nearly 20 degrees below average. A cooler air mass arrives following a cool front Monday night and will push temperatures into the 50's through the rest of the week. Average highs should be in the upper 50's, to near 60 degrees. 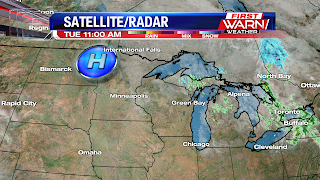 High pressure will remain in place over the Great Lakes keeping skies clear through the end of the week. By Thursday evening a dip in the jet stream will help push temperatures back into the upper 40's and low 50's through the weekend. Rain showers will also be possible Friday, Saturday and Sunday while a larger storm system takes aim on the East Coast. 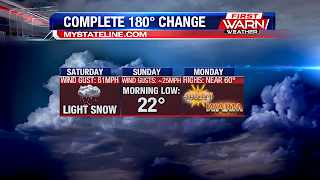 After some snow, cold temperatures and winds gusting upwards of 60mph this past weekend... we are looking at a complete 180° change today. 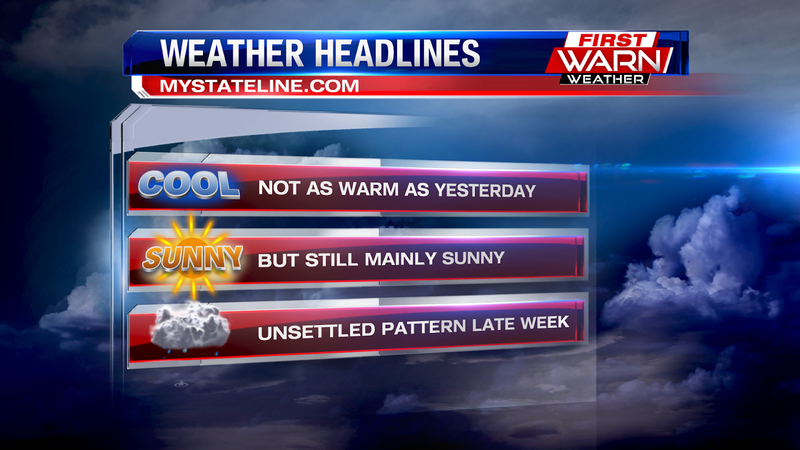 It should be partly to mainly sunny with highs near 60°, which is right where they should be for this time of the year. 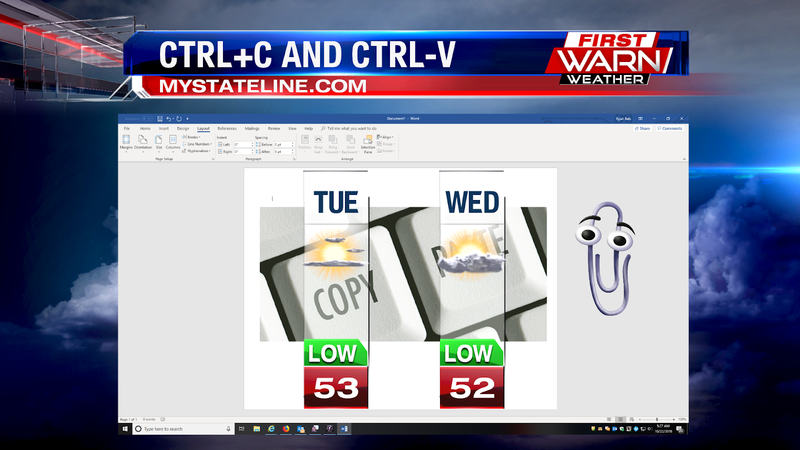 While temperatures will tumble back into the upper 40s and lower 50s over the next few days, we will be able to copy and paste the sunny forecast. 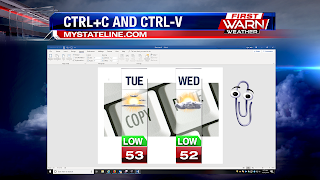 Ctrl-C (Copy) today's sunshine and Ctrl-V (paste) it onto Tuesday and Wednesday. Tomorrow night's drawing of the Mega Millions will be the largest in the United States at $1.6 Billion. So let's play Scratch-A-4-Cast and see if we can win a sunny forecast? We won! Sunshine is expected Tuesday, Wednesday and Thursday with highs falling back down into the upper 40s and lower 50s. 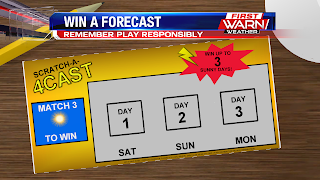 Now if you win the Mega Millions, don't forget to share with me or I won't bring any sunshine to the forecast. October 10 was the last day that our temperatures were above our normal high for this time of year, after starting October with a significant temperature surplus. Since that date, for the last 11 days we have dropped below normal and have taken a decidedly cold turn. Instead of a temperature surplus, we are now running almost a 2 degree deficit, and it looks as though the trend will continue. Yesterday's snow squalls and our low temperature this morning were particularly notable. 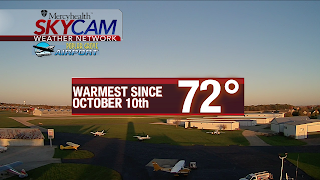 Today, we tied the record low temperature of 22 degrees for this date, a record that was set initially back in 1952. The high winds, cold temperatures and snow squalls yesterday were also a sign of things to come. 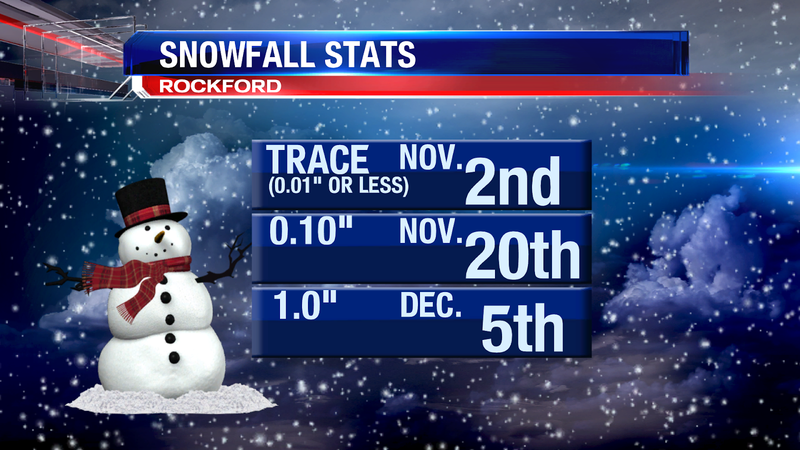 In the Stateline, we typically see our first snowfall of .1 inch or greater in October. This week will continue to trend below normal with highs in the 50's and lows in the 30's, although on Monday we could get pretty close to 60! Have a great start to your week! Skies remain clear and dry for most of Thursday night, but clouds will be on the increase through Friday morning. Moisture from the southwest will be pulled into northern Illinois and southern Wisconsin through Friday morning, eventually leading to light rain by the afternoon. Early morning hours should be dry, but light rain will begin to move in from the west between 10am and 12pm, becoming more widespread during the early afternoon. 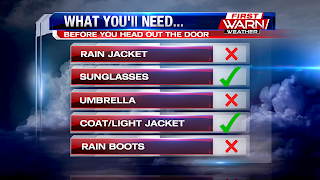 Rainfall totals will remain light and likely under a quarter of an inch. A cold front will move through Friday evening clearing skies during the overnight. An even stronger cold front moves in Saturday morning bringing gusty North winds and scattered showers, possibly mixed with a few snowflakes, through the afternoon. 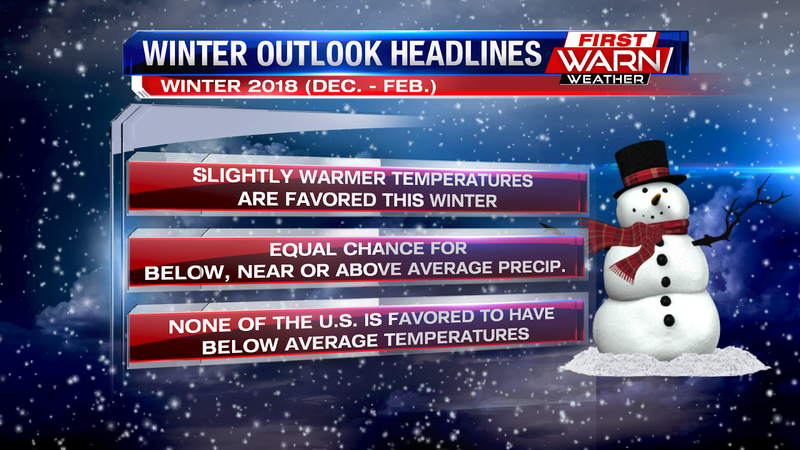 The Climate Prediction Center has released their annual Winter Outlook. It covers the months of December, January and February, which considered is meteorological winter even though the winter solstice isn't until December 21st. The last four winters coast to coast have been mild. This year's winter we are projected to see a slight El Nino, and much of the United States is favored to see warmer than normal temperatures. 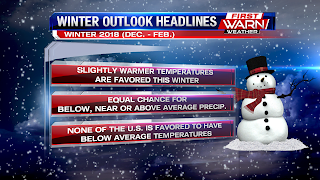 This year's temperature outlook favors slightly warmer temperatures for the Stateline area. What is interesting is that no part of the United States is favored to see cooler than normal temperatures. 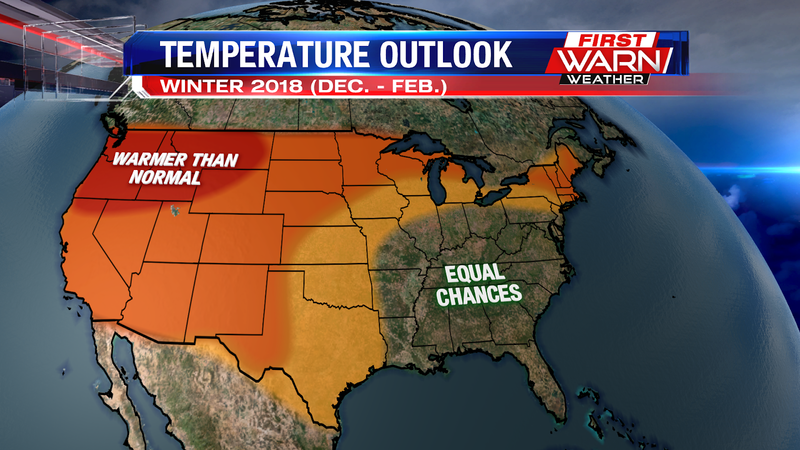 That doesn't mean there won't be cold and snowy days, but on average for the 90 days between December and February we should see slightly warmer than average temperatures. 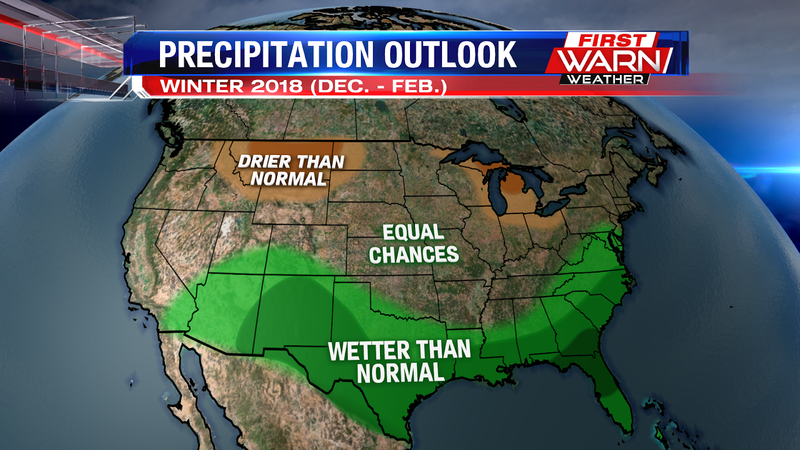 This year's precipitation outlook does not favor either drier or wetter than normal for the Stateline area. 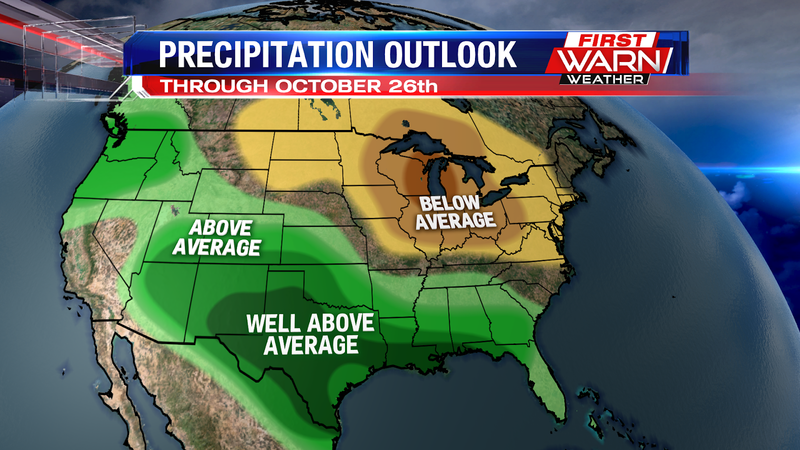 We have an equal chance of seeing above, near or below average precipitation. 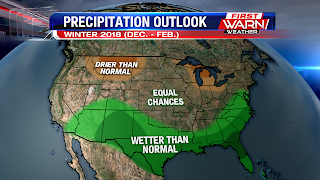 In this seasonal outlook, precipitation is not necessarily snowfall. 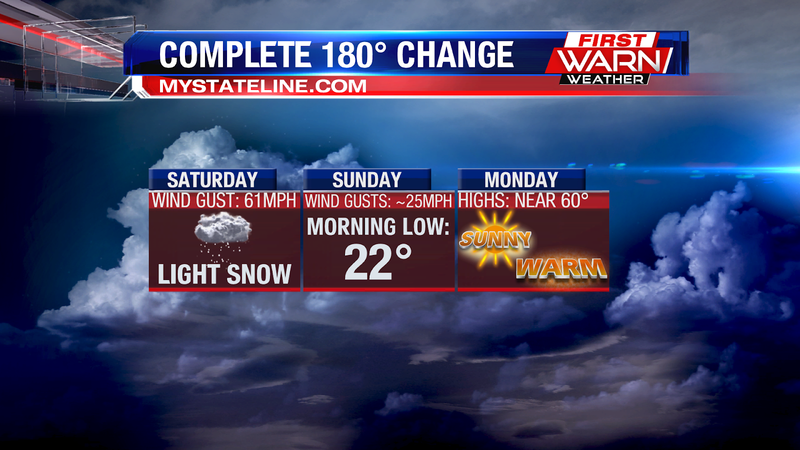 The winds of change have been blowing quite a bit these past few days bringing us a wide range in temperatures. Northerly winds Wednesday afternoon kept highs in the upper 40's and low 50's, but southwest winds Thursday will bring those numbers back up near 60 degrees. 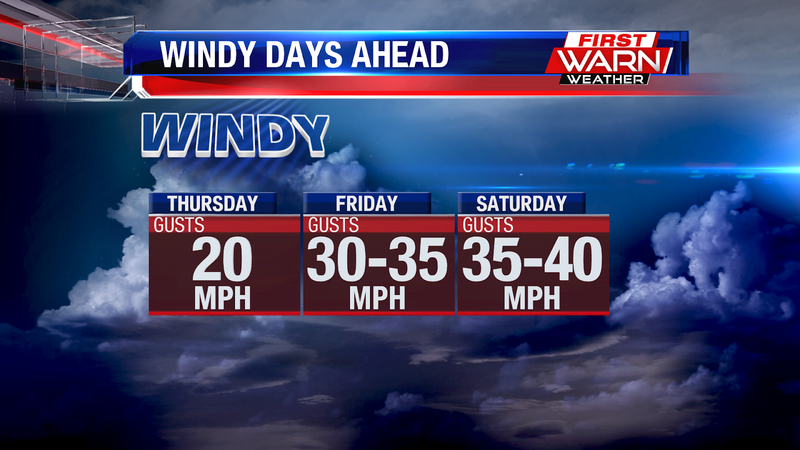 Strong jet stream winds overhead will keep surface winds gusty through the start of the weekend. 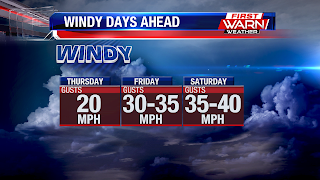 Southwest winds will gust as high as 20-25mph Thursday, 30mph on Friday but up to 40mph Saturday. High pressure will move back in Sunday afternoon, helping to ease winds into early next week. 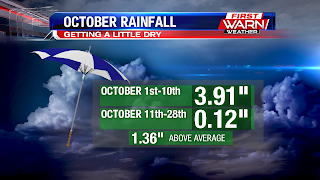 During the first 10 days of October almost four inches of rain fell in Rockford, pushing us well above the monthly rainfall average. But the last week has been just the opposite, chilly and dry. 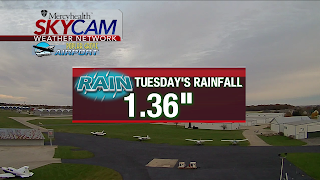 Within the last seven days, less than a tenth of an inch of rain has fallen. 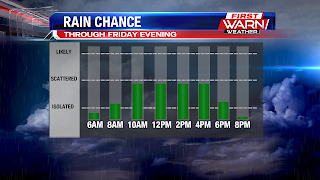 The dry stretch will continue for another day (Thursday) before a small chance for rain returns by mid-morning Friday. 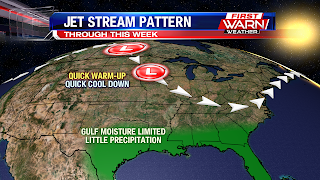 The atmosphere has been very dry over the last week as low pressure systems have been moving in from Canada and Gulf moisture blocked to the south. So even as moisture increases over northern Illinois and southern Wisconsin late Thursday night and Friday, the rain that comes down (if any) should remain fairly light. A strong cold front will pass Friday night followed by another cold front Saturday. Scattered showers are likely Saturday afternoon, with light snow possible further north. But the drier pattern continues into next week with temperatures staying below average. It was a chilly start yesterday, as Tuesday's morning low was in the upper 20s. 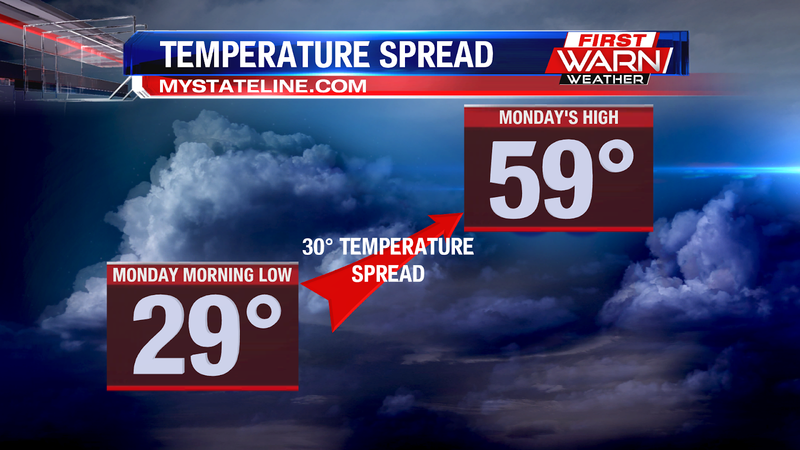 We managed to warm it up 30° under partly to mainly sunny skies, and topped out at 59°. While we were still below average, we were closer than we have been. Our average should be in the lower 60s. Today we will not be as warm as yesterday. Highs today will top out in the upper 40s to near 50°. 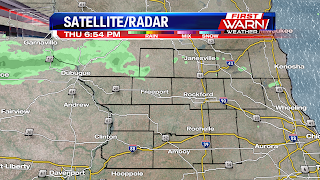 Portions of the Stateline area saw some clouds early, but this afternoon there will be some sunshine again. One more day of sunshine is expected tomorrow before clouds increase Friday and we bring back in the chance for some showers. 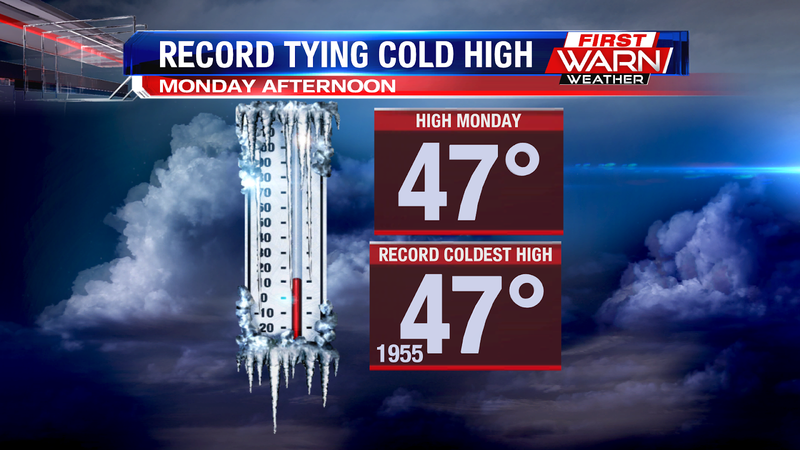 While we were well below average yesterday, we still managed to tie a record for our high temperature. 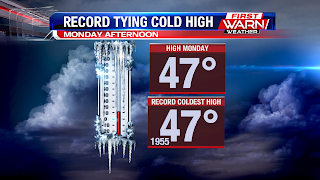 We tied 1955 with the coldest high temperature of 47°. Your morning and evening commute will be all green lights thanks to the sunny skies. The sunshine will linger into the next few days. The Mega Millions has a record jackpot tonight, so let's play Scratch-A-4-Cast. We won't be able to match 3 sunny days as some clouds build in Friday with the slight chance for showers. Freeze Warnings have once again been issued for northern Illinois, beginning late Monday evening and lasting through Tuesday morning. High pressure will continue to move across Missouri Monday evening keeping skies clear during the overnight. Temperatures currently in the mid and upper 30's will fall to right around 30 degrees by Tuesday morning. 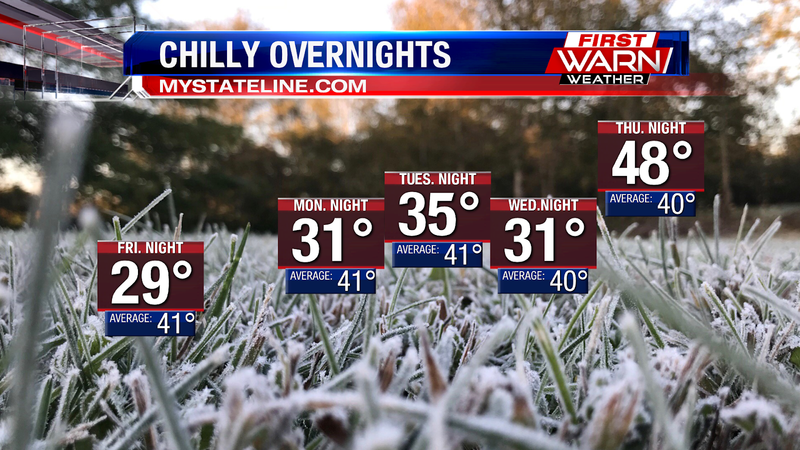 A light breeze may help keep frost from becoming too thick by morning, but widespread frost is expected by morning. Southwest winds will quickly increase during the morning and afternoon bringing temperatures back up into the 50's Tuesday. It's official! This morning at the Chicago Rockford International Airport we received our first snow of the season. The airport received a trace of snow as some mixed rain/snow showers moved through the area. 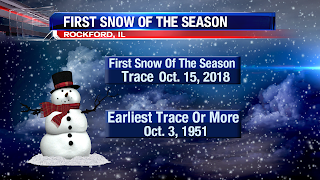 The earliest we have received a trace of snow was back on October 3, 1951. 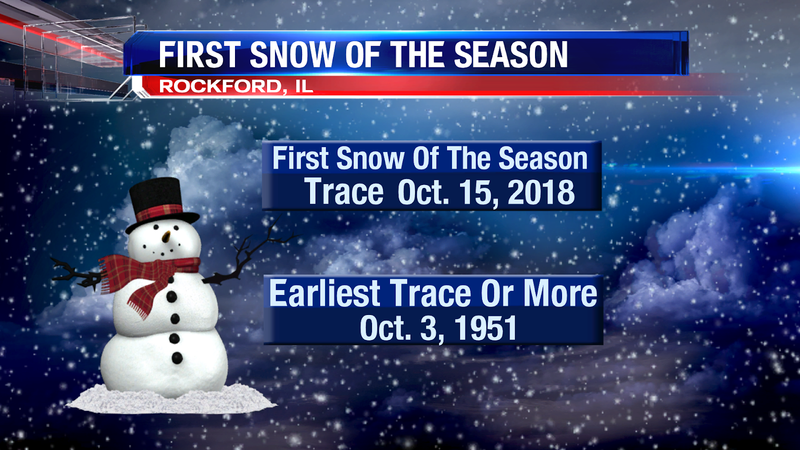 Normally, we receive our first trace of snow in early November. So today's trace of snow is earlier than normal, but not unheard of. Usually our first inch of snowfall comes towards the beginning of December. So there is more snow ahead for us. 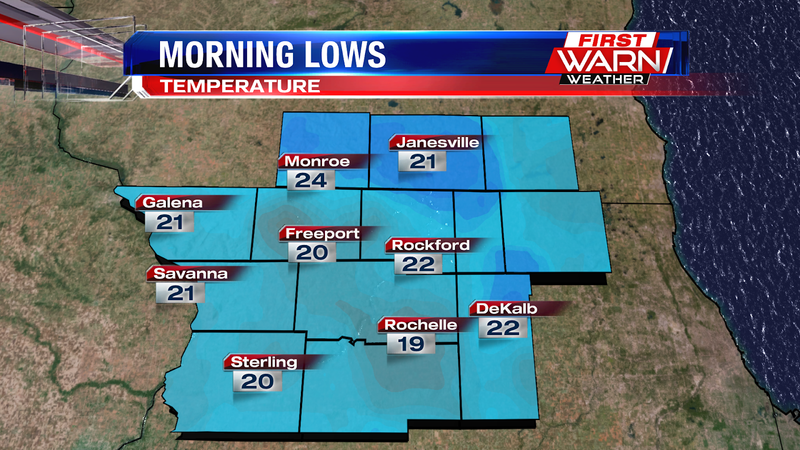 This past Friday night and into Saturday morning, we bottomed out at 29° and that marks our first freeze of the year. 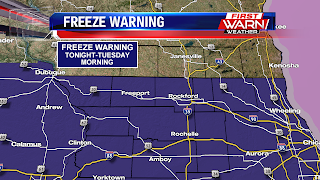 Tonight we will see the potential for some frost with lows down into the lower 30s. 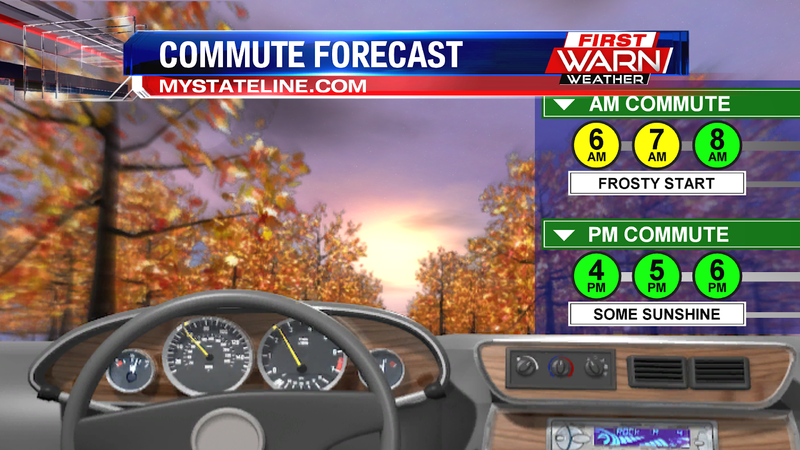 A warm up as we go into Thursday night with lows into the upper 40s. Temperatures this week will be up and down thanks to how the jet stream is positioned over the Midwest and Great Lakes. Winds will be coming in from the Northwest, allowing quick moving low pressure systems to sweep down from Canada. 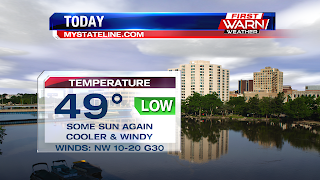 With each low that passes, southerly winds ahead of the low will bring temperatures up, but northerly winds behind the low will knock temperatures right back down. 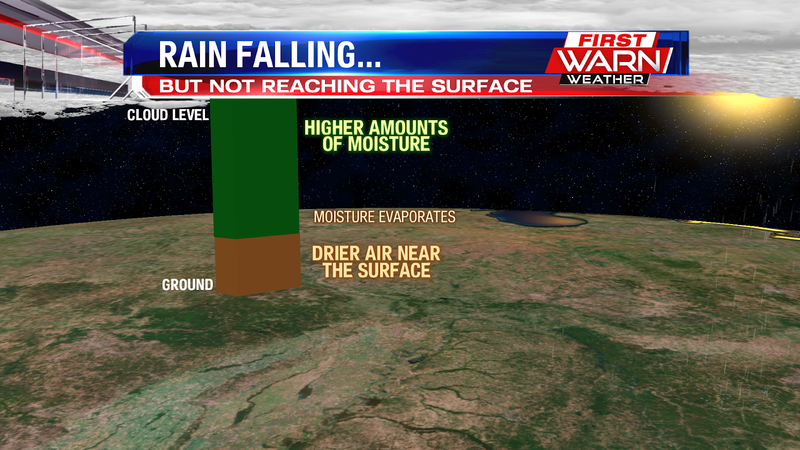 Gulf moisture will remain limited so as each storm system moves through, skies will most likely remain dry. There might be a few light rain showers during the day Friday, but even those look to remain relatively limited at this point. Even though temperatures will warm up ahead of each passing low, highs will still remain below average in the 40's and 50's. Average highs should be in the low 60's. We may begin to see a little more of a warming trend towards the beginning of next - with highs back in the 60's. A cold front is moving through northern Illinois and southern Wisconsin Sunday evening and will work to bring temperatures from the upper 40's, down into the low 30's by Monday morning. 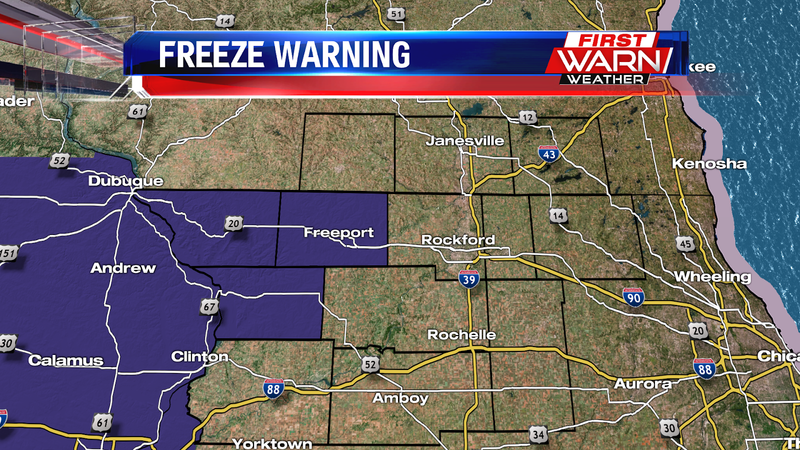 A Freeze Warning will go into effect for Stephenson, Jo Daviess and Carroll counties beginning at 3am Monday morning. Light rain showers have been developing directly behind the front from Wisconsin down through Missouri, but snow has also been mixing in where temperatures have fallen into the low 30's. Already a light dusting of snow has been observed over Wisconsin and parts of Iowa, and even down in the panhandle of Oklahoma!! As the cold front continues to move east overnight, cooler air will funnel into the Stateline and this may help to support some light flurries or brief light snow showers for some during the overnight - most likely between 1am and 4am. Don't worry, though, because accumulating snow is not expected. Already some of the snow on the backside of the precipitation is beginning to break apart in eastern Iowa as dry air is also moving in. 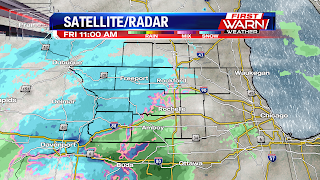 Any accumulating snow will remain to the north in Wisconsin and back further to the west over Iowa. 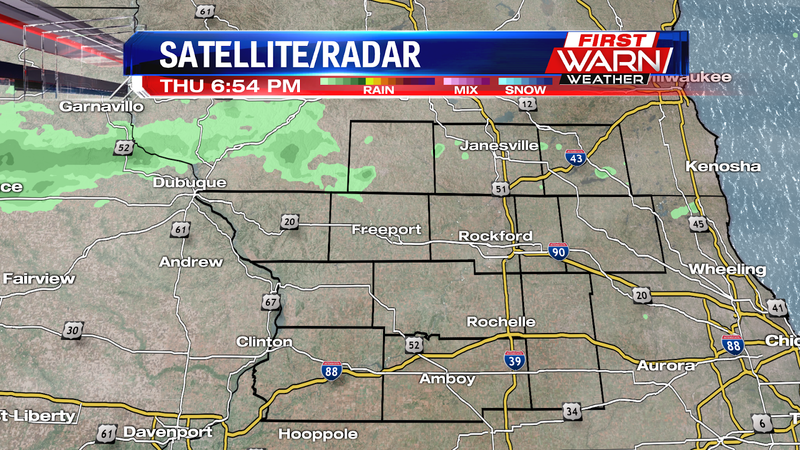 If any light snow were to stick in northwest Illinois, it would most likely be on grassy surfaces. 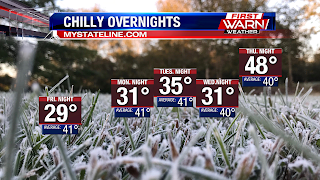 With temperatures falling near freezing by Monday morning, however, there could be some slight spots on elevated surfaces. Something to keep in mind during the morning commute. It was definitely a frosty and freezing Friday morning throughout the area. This afternoon we will see mainly cloudy skies and highs warming into the mid 40s. 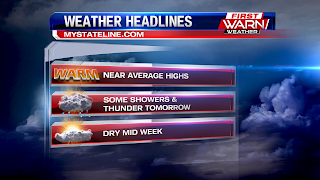 Expect a dry start to the weekend, but then the chance for showers returns Sunday and Monday. Some sun and clouds return for the middle of next week. 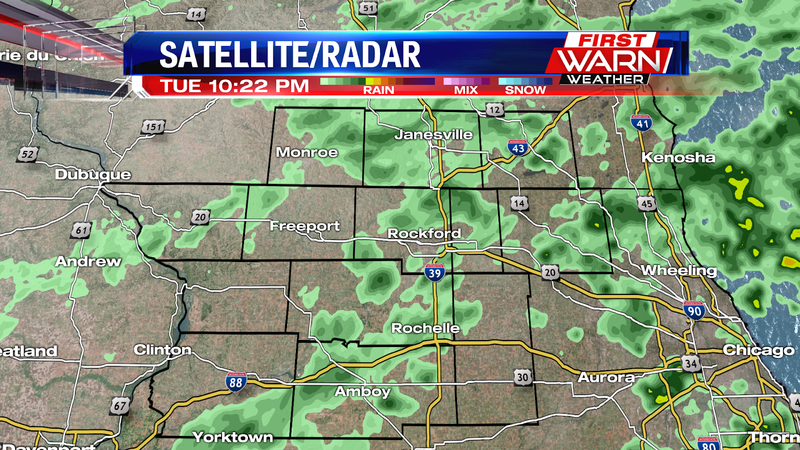 Some precipitation is showing up on radar, but we should remain mainly dry today. Cloudy skies will be the story today. A few locations along I-80 that are reporting some snow flakes falling. 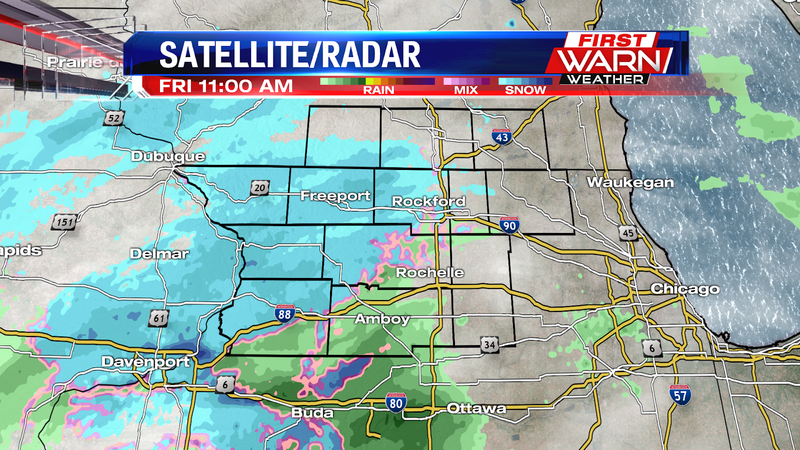 No accumulations are expected, and much of the Stateline area will not see any flurries. Can we win at scratch-a-4-cast today? 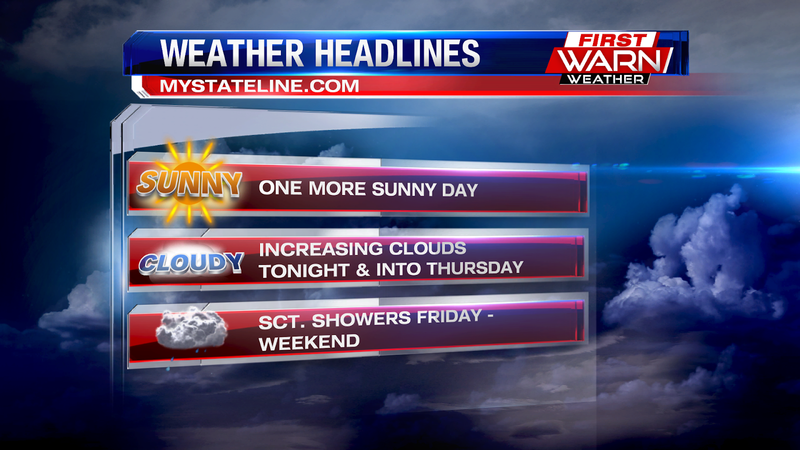 Some sunshine peaking through for your Saturday, but Sunday and Monday bring back the chance for a shower. So we unfortunately didn't win with the forecast.